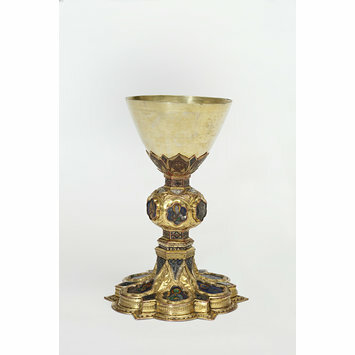 The chalice is inscribed with the name of the goldsmith, common practice in fourteenth century Tuscany. The arms of the Rocchi family of Siena on the piece suggest that it was made for a church within the city and was presented as a gift. It was common to leave such gifts to churches in wills, usually linked to the saying of commemorative masses benefiting the souls of the giver and their family. The image of Saint Francis strongly suggests that the church was a Franciscan one. The enamel decoration was relatively small in scale, and so could only have been appreciated by the priest conducting mass. However, the strong outlines of the chalice would have given it visual presence from a distance. Witnessing the rite of the mass was an important aspect of medieval worship, and the chalice would have been prominent on the altar. The foot is comprised of twelve lobes, and is conceived as a sexfoil superimposed on a six-pointed star. The sides of the foot are decorated with a battlemented ornament in relief, and a running band of punched ornament. The foot is decorated with relief ornament in the form of six acanthus leaves on a punched ground, and a running band which forms frames for six sexfoil enamel plaques, alternating with smaller lozenge forms which also contain enamels. The main enamels represent the Crucifixion, with to either side, the Virgin Mary wringing her hands together and St John, hands clasped, but head turned away and bowed;continuing anti-clockwise from John, St Laurence; Saint Martin; and St Nicholas. The junction with the stem is marked by six more triangular enamel plaques. The base of the stem carries several mouldings, within which the inscription runs around the stem. The stem proper is hexagonal, and above and below the knop is decorated with lozenges in champleve enamel. The knop is formed as a flattened sphere, with foliate decoration in relief, and six projecting sexfoil enamels. These represent (running anticlockwise, starting above the Crucifixion plaque) a tonsured martyr saint, probably be St Stephen, given the appearance of Saint Laurence on the foot; Moses; St Peter; St Paul; and St Francis receiving the stigmata. The calyx mirrors the twelve pointed form of the foot, and carries six seraphs in champleve enamel. The cup is of silver. Although this inscription was first correctly transcribed in 1926, it has been misquoted several times in the literature. The third word has been rendered as 'MONDUSI'. However, a comparison between the 'M' in 'IACHOMO' and the first letter of the third word makes it clear that this letter is a 'T' not an 'M'. It is not known how or when this chalice came from Italy to England, although it is likely that it came onto the market during the Napoleonic suppressions of the early 1800s. The presence of Saint Francis on the knop of the chalice strongly suggests that the piece was intended for a Franciscan church. Historical significance: Chalices of this sort were common in Central Italian churches. The use of enamel meant that the chalice could be enlivened with colourful programmes of saints, probably chosen to be appropriate for particular churches and altars. The enamel decoration was tiny, and so could only have been appreciated by someone close to the chalice. In practice, this would tend to mean the priest, deacons and sacristan of the church. The strong outlines of the object would however, have given the chalice some visual presence from a distance. Witnessing the rite of the mass was an important aspect of medieval worship, and the chalice would have been prominent on the altar. Although the ceremony of the mass culminated in the raising of the host, it was followed by the careful raising of the chalice containing the consecrated wine. The heraldry on the chalice linked the donor's family in the most obvious way to the spiritual benefits of the mass. The presence of two coats of arms on this chalice indicates that it was presented as a gift to a church. Such gifts were common, especially as testamentary bequests, and as the fourteenth century went on, were more and more likely to bear arms. When gifts of this sort were made as part of a testamentary bequest, they were usually linked to the saying of commemorative masses to benefit the souls of the giver and their family. Sometimes, chalices were given alone, sometimes they were part of the furnishings of a whole chapel. During the fourteenth and fifteenth centuries, major churches assembled large collections of such gifts and bequests - in 1380, the cathedral of Pisa had forty-one chalices. At the same time, the visitation records of Italian parish churches often reveal that such churches struggled to maintain even the most basic furnishings. For this reason, some large institutions, such as the basilica of San Francesco in Assisi, seem to have loaned chalices and other furnishings out. This chalice, whilst visually very impressive, represents a somewhat cheaper alternative popularised by the goldsmiths of Siena. The most prestigious chalices were made of gold. Silver chalices were next in importance, and the earliest examples of this form of chalice seem to have been made in silver. The present chalice was an alternative type, which although it looked like the silver chalices, was mainly made of copper-gilt, with only the cup and enamels of silver. An even more cut price alternative was also available, where the foot had little or no decoration, and only the knop bore enamels. Inscribed: +frate iachomo mondushi+de sena+me fecit (Brother James Mondusi of Siena ordered me to be made). The chalice is inscribed with the name of the goldsmith, and the town in which he worked. The presence of the arms of the Rocchi family of Siena on the piece suggests that it was made for a church within the city. It has sometimes been suggested that the inscription could indicate the donor rather than the maker. This suggestion is based on the idea that credit for having made an object was sometimes given to the donor rather than the maker, and also on the fact that the person named in the inscription is a friar ('Fra'). However, this hypothesis can be disproved on several grounds. Sienese chalices commonly carry inscriptions naming goldsmiths who are known to us from documentary sources. These inscriptions often follow the format 'X made me'. Where Sienese chalices have inscriptions naming donors, these usually follow the format 'X caused this to be made'. For example, a chalice with this latter type of inscription, made by the Sienese goldsmith Michele di Tommaso, was made in 1373 for the church of S. Margarita, Cortona, and survives in the Museo Diocesano in that town. In the case of 'Fra Giacomo Tondusi', a number of other pieces of ecclesiastical metalwork survive with inscriptions naming him as the maker - a reliquary now in the museum at Palazzo Venezia, Rome; and a cross now in the Museo dell'Opera del Duomo, Siena. This 'Fra Giacomo' is almost certainly identical with the extremely old Certosan friar and goldsmith called 'frate Iacopo' whom Ghiberti met in around 1416, and who is described in his Commentaries. We can therefore confidently conclude that the inscription in this case is naming the maker, not the donor. The date of the V&A chalice is less certain. This is partly caused by the uncertainties surrounding the dates of Fra Giacomo's activity. A Giacomo di Tondo is known to us as the son of the famous early Trecento goldsmith Tondino di Guerrino. The earliest record of him dates from 1362, when he was elected to a public office in Siena. However, if we are to accept that this man is identical with Fra Giacomo di Tondo, a very old man in 1416, then he must have had an extraordinarily long career. 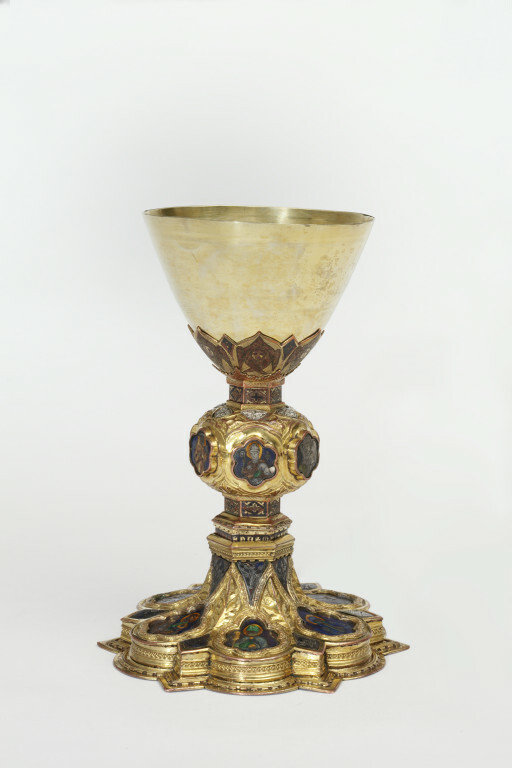 The V&A chalice is similar in form and decoration to a pair of chalices made by the goldsmith Andrea di Petruccio, one now in the Cathedral of Avila, Spain, the other in the Fitzwilliam Museum, Cambridge. It also resembles a chalice by Giacomo di Guerrino in the Loyola University Museum of Art, Chicago, and a chalice by Paolo di Giovanni and Giacomo da Siena in the Walters Art Gallery, Baltimore, as well as several others. All of these goldsmiths worked in the second half of the fourteenth century, and it would appear that this type of chalice could have been made at any time in this period.